Q. Is online visa application mandatory for all foreign nationals? Ans: Yes, online visa application is mandatory for all foreign nationals with effect from August 17, 2010. Q. After registering online, where do I submit the visa application? Ans: Bangladeshi nationals residing in Dhaka must apply at Indian Visa Application Centre- Dhaka ( Jamuna Future Park ) , Khulna must apply at IVAC, Khulna , Barisal Divisions must apply at IVAC Barisal, Mymensingh must apply at IVAC, Mymensingh, Jessore division must apply at IVAC, Jessore and those residing at Sylhet Division must apply at IVAC, Sylhet and those residing at Chittagong Division must apply at IVAC, Chittagong and those residing at Rajshahi Division must apply at IVAC, Rajshahi respectively. Other foreign nationals may apply at Indian Visa Application Centre- Dhaka ( Jamuna Future Park ) or Indian Visa Application Centre Chittagong. Applicants from Satkhira, Brahmanbaria, Noakhali, Comilla, Thakurgoan and Bogura can apply at their own districts Indian Visa Application Centre. Q . How many online applications and photographs are required to be submitted by an applicant? Ans: Only one application and one recent color photograph are required to be submitted. Q- Do I have to submit the application at IVAC at the time given in the online application or anytime between 0800 hrs to 1200hrs. Ans: It is advisable that you submit the application at the time indicated in the online application. However, your application will be accepted any time between 0800 hrs to 1200 hrs on the date of submission. Q. I made a mistake while filling up the online application. Is it possible to make corrections online?. Ans:. No, there is no possibility of making corrections online. You need to apply again. Q. I registered online. What should I do to get a date of appointment? Ans:. 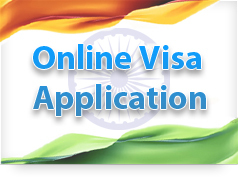 All categories of Indian visas are accepted on a walk in basis. No need to take an appointment date. Q. I registered online. But I could not take a print out of the online application. How can I get a printout of the online application? Ans: Please log on to Reprint option on top right corner of the online application. Please fill in web file number and date of birth and take a print out of online application. Q. I plan to travel to India, but am yet to firm up the dates. Can I apply online for different dates? Ans: All categories of Indian visas are accepted on a walk in basis. Q. By mistake I selected Chittagong instead of Dhaka online. Can I still submit the application at IVAC, Dhaka? Ans: No, online applications registered in Chittagong cannot be accepted in Dhaka and vice-versa. Q. I could not submit the documents on the date of submission. Can I submit the documents anytime after the date of submission? Ans: No, You will have to submit the documents on the date of submission given in online application. Q. Whom should I contact to know the status of my visa application. Ans: Please get in touch with the IVAC where you had submitted the visa application through telephone, fax or e-mail. You must mention your Sticker No. or Passport Number while making enquiries. For contact details of IVAC, please click here (On www.ivacbd.com). Q 1. Is there any visa fee required to be paid by Bangladeshi Passport holders for travel to India? Ans: No. However IVAC charges Visa Processing Fee (VPF) as per rate indicated under "General Information". Q 2. . Is there any visa fee required for persons other than holders of Bangladeshi Passports? Ans. Yes. Such persons are required to pay visa fee as per schedule of fee approved by Government of India for various nationalities, unless nationals of any country or countries are exempted from payment of visa fee as per bilateral agreements. 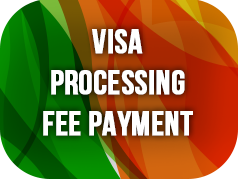 To see the visa fee schedule, click here. Q 3. How many visa applications are required to be filled up by an applicant? Ans. Only one set of visa application form is required to be filled up by each applicant. Q 4. Can the visa application of a person be submitted by another person? Ans. Any member of the family is allowed to submit visa applications on behalf of other members of family subject to a maximum of five persons and subject to proof of identification. For the purpose family constitutes spouse, children and parents. Visa applications of Hon'ble Members of Parliament and Judiciary; Chairman/ CEO/ Managing Director of established companies and members of their families; and persons above 65 years of age can be submitted through authorized representative. Q 5. Are there any special requirements for Bangladeshi defense /security personnel while applying for Indian visa? Ans. Serving /retired defense/police/security personnel have to submit a proforma in the prescribed format along with the visa application form for Bangladeshi Passport holders. Q 6. What is restricted or protected area? Ans. There are certain places/regions in India that are designated as Restricted or Protected areas to which access is limited and requires a special permit. Visa applicants who wish to visit a restricted/protected area are required to fill an additional form. The processing of such applications can take up to four weeks and, in some cases, even longer. A Q1. What is a Business Visa? Ans. Business Visa is granted to a foreign national who wants to visit India to establish an industrial/business venture or to explore possibilities to set up industrial/business venture, or wants to purchase/sell industrial products in India. This Visa is granted subject to following conditions:- (i) The applicant is a person of assured financial standing and expertise in the field of the intended business. (v) The grant of Business Visa is subject to any instructions issued by the Government of India on the basis of reciprocity with other foreign countries from time to time. :- 2 -: (v) The Business Visa must be issued from the country of origin, or from the country of domicile of the foreigner provided the period of permanent residence of that applicant in that particular country is for more than 2 years. Q.2. Who are eligible for a Business Visa? Q.3. What is the duration of a Business Visa? Q.4. What documents are required to be submitted alongwith application for a Business Visa? Q.5. What is an Employment Visa? Q. 6. Who are eligible for Employment Visa? Q.7. What is the duration of an Employment Visa? Q.8. What documents are required to be submitted alongwith application for Employment Visa? Q10 Can foreign nationals already in India for executing projects on Business Visas be allowed to extend their Business Visas beyond 31.10.2009? Q11 Can foreign nationals already in India for executing projects on Business Visas be allowed to convert their Business Visas to Employment Visas without leaving the country? Q12 Which category of Visa will be granted to family members of foreign nationals coming to India on Business Visas? Ans. Indian Missions may grant an "X" Visa [i.e. a Dependent Visa] to the family members of a foreign national granted a Business Visa at their discretion, subject to usual security checks provided the family members are otherwise eligible for grant of such a Visa. Q13 Which category of Visa will be granted to family members of foreign nationals coming to India on Employment? Ans. In respect of family members of a foreign national who is granted "E" Visa, Indian Missions may grant an "X" Visa [i.e. Dependent Visa]. The validity of the "X" Visa could be co-terminus with the validity of the Visa of the principal Visa holder or for such shorter duration as may be considered necessary by the Indian Mission, subject to usual security checks provided the family members are otherwise eligible for grant of such a Visa. Q15 Whether a foreign company/organization that does not have any Project Office/subsidiary/joint venture/branch office in India can sponsor a foreign national/employee of a foreign company for Employment Visa? Q16 Whether an Indian company/organization which has awarded a contract for execution of a project to a foreign company that does not have any base in India, can sponsor employee of foreign company for Employment Visa? Q17 If the Indian organization/entity sponsors an Employment Visa, does this mean that the Indian organization/entity has to necessarily be the legal employer of the person? Q.18 Which category of Visa will be granted to the foreign language teachers/interpreters? Q19 Which category of Visa will be granted to the foreign specialist Chefs? Q.20 Which type of Visa would be granted to senior management personnel and/or specialists employed by foreign firms who are relocated to India to work on specific project/management assignment? Q.1. Is there any special arrangement for applicants requiring medical visas? Ans: A dedicated Medical Help Desk at IVAC Gulshan accepts only emergency medical visa applications even before their scheduled appointment date. Q.2.How many medical attendants are allowed with a patient? Ans: Upto three medical attendants can be issued visa with a patient. Q.3. Is medical treatment allowed on Tourist Visa. Ans: Under normal circumstances, medical treatment on Tourist Visa is not permissible and may result in refusal of visa subsequently. However, in case of any emergency, Tourist Visa should be converted into Medical Visa for medical treatment. Q.4. I travelled to India on Tourist Visa and had to undergo medical treatment in urgency. Now, I want to apply for medical visa. What should I do? Ans: While submitting your application for medical visa, please submit all the documents, including of your previous treatment in India. Q.5. What are the documents required for medical visa in addition to the general documents? Ans: (i) Medical certificate, in original, from recognised hospitals/ doctors indicating in detail the medical condition of the patient; (ii) Recommendation from the attending doctor for availing treatment abroad in case of first visit; (iii) recommendation from the attending doctor in India in case of continued treatment in India; (iv) In case of hospitalisation or long term treatment, proof of financial resources. Q.6. My patient is already in India. I want to apply for a medical attendant visa. Ans: Medical Attendant visas are issued alongwith patient only. Q.7. Is it necessary that Medical Attendants should be blood relative of the patient? Ans: No, there is no such requirement. Q: Where do I go to pay the Indian Visa Application fee? by selecting your chosen payment option. Q: Can I see/fill up the next tabs before completing the first ones? Q: What information do I need to have before making the payment? have submitted your Visa application you would get the Web File Number from IVAC. Q: How do I select and what should I enter in Application Info? (i ) In the next two boxes enter your WEB FILE NUMBER. Both entries must be exactly same. in BDT below will be automatically populated. (iv) VISA TYPE: Select the Visa type that you have applied for from the drop-down list. (v) PASSPORT NUMBER: Enter your passport number accurately. (vi) Save and Next: This button will be activated only after you have completed the above fields. Click on this button to proceed to the next tab. Q: How do I select and what should I enter in Personal Info? (i i) After done with the above steps, click on the ‘Save and show overview’ button below. Q: What is the Overview tab? What to do here? must click to tick the checkbox beside ‘I agree to the Terms of Service’ to proceed. Q: What if I don’t check the ‘I agree to the Terms of Service’ checkbox? can view the ‘Terms of Service’ by clicking on it. MasterCard or bKash or Internet banking), you will see the total ‘Payable Amount’ at the right side. required information/data in the boxes click on ‘Pay’. After transaction is successfully processed, you will be informed and receive an invoice in your email. A confirmation SMS will also be sent to the mobile number you have provided. Q: Can I edit my information before making the payment? have been redirected to the payment page, no more editing is possible. Q: How do I know if my payment was successful or not? How can I be confirmed? address. You can print or download the invoice for your reference later. Q: What is the ‘Convenience Fees’ in the Payment page? Why this is charged from me? Q: What are the different payment options available for me? like DBBL Nexus, Q-Cash, Fast Cash, etc. Mutual Trust Bank Internet Banking. MyCash, Mcash, and AB Direct. accepted in the payment application. Q: Can I check my payment status? How? either ‘PAID’ or ‘UNPAID’ will appear with relevant information. Q: What is the ‘Checked Status’ shown with my Payment Status? Q: How long can I check my Payment and Checked Status? made the payment. After 15 days, this information will not be available anymore. Q: What is Appointment Date? Q: Why is my Appointment Date field empty in the Payment Status page? (three) days after making the payment. Q: What happens if I do not visit the IVAC in 3 days after making the payment as WALK-IN? submit documents within 3 days, your payment will be void and the amount paid will not be refunded. You will have to pay the Visa Fee again for a new appointment. A: Once a payment has been successful, there is no option for refund. to communicate with your bank/provider. Visa fees can I pay at one go? A: Yes, you can make bulk/multiple payment in a single transaction. to fill in the different fields like Web File Number, Passport Number, Mobile Number etc. separately. applicants' payment, there will be an item wise invoice generated and sent to your Email address. to: ivac@sslwireless.com for further investigation. Q: I am not being able to pay with my card or internet banking or wallet. What can I do? bank/provider to enable it for online e-Commerce transaction in this site.